One thing I love about Christmas is receiving Christmas cards in the mail. Every day I look forward to checking the mailbox for new cards. I enjoy looking at the designs that different people have chosen and reading the warm wishes that my friends and family are sending my way. Our family always hangs the cards up around the fireplace and around the living room as we get them. Every few days we will look around at them all and pick out our favorites. Tracy always loves the glittery ones and my favorites are usually the beautiful snowy landscapes. When it comes to Christmas cards, I also love shopping for my own. I love looking at them in various stores and trying to pick out the perfect cards for me to send. I love making address labels for them and picking out Christmasy stickers to decorate them with. 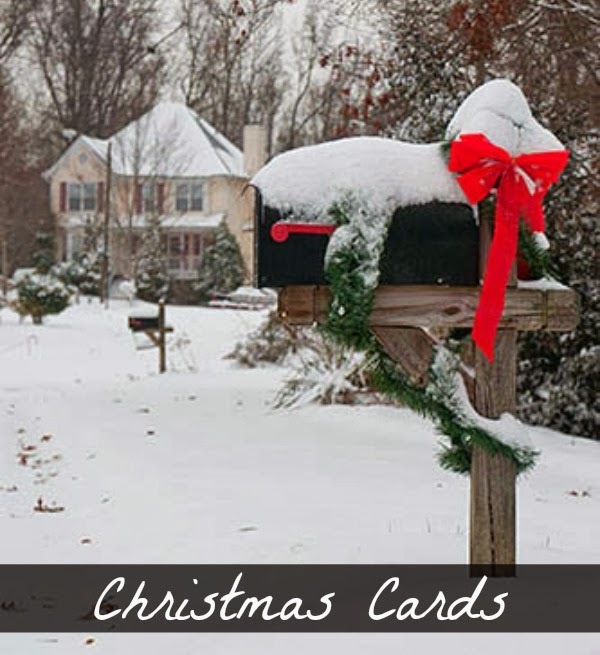 I have already chosen my cards for this year, but here are some of my other favorites. They are a little different from what I would normally pick. Have you already chosen yours? Great reminder... every year I plan to be ahead of schedule... then end up sending a hasty email. I know HORRIBLE!!!!! I have gotten my and have already written them out. In my house in Michigan I displayed my card on the ledge on the stairs. In my new house I'm not sure where I will be putting them. I make my Christmas cards every year...it always winds up taking WAY longer than I think it will each year but I love the attention that goes into a home made card. These are such pretty cards. I really need to get start on my cards for this year. I love a good, glittery Christmas card! I'm not giving out cards this year. I bought everyone a gift. In the past, I've chosen whimsical cards. Like a gingerbread man with really buttons and a scarf around his neck. I love unique cards. I just helped my mom design the family Christmas card and I can not wait to see them!